Goodness y’all, are you finding the upcoming holidays making life hectic yet? 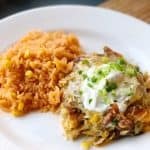 We are sure feeling it around my house and while I’ve been sharing everything Thanksgiving and Christmas the past few weeks I wanted to take a break and share with you all one of those go-to easy weeknight dinner recipes I can always count on: Easy Green Enchilada Casserole. My family loves everything Mexican food so I know that when I make this casserole the whole family will be happy! Pick up a precooked rotisserie chicken at the grocery store along with the few other ingredients then simply layer and pop in the oven! Easy peasy and dinner is on the table in an hour! 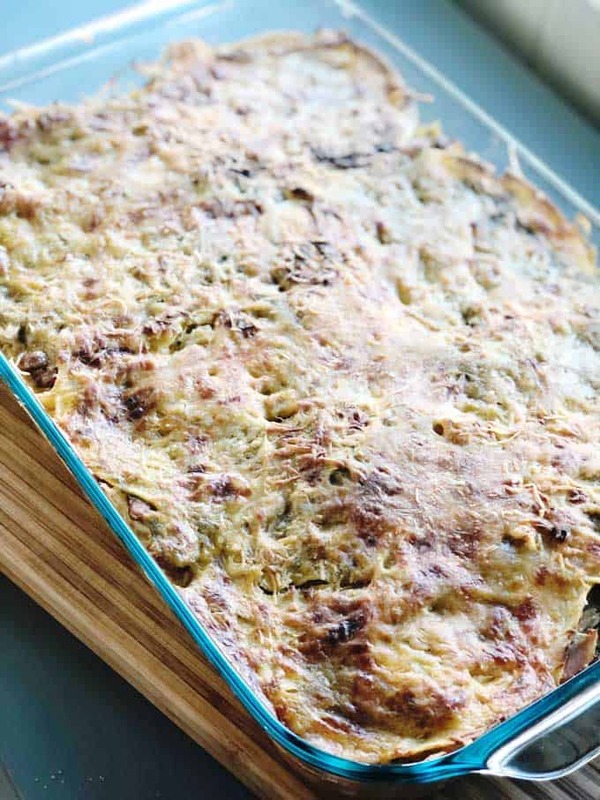 Easy, cheesy Green Enchilada Casserole is a delicious family-friendly weeknight dinner recipe on the table in just an hour! Shred roasted chicken and set to the side. Mix corn, beans, chiles, salt, and pepper in a small bowl and set to the side. Place six tortillas on top of sauce and sprinkle with the shredded Mexican cheese on top, just enough to cover. Add half of the shredded chicken on top of cheese. Add half of corn mixture and spread evenly, top with 6 tortillas. 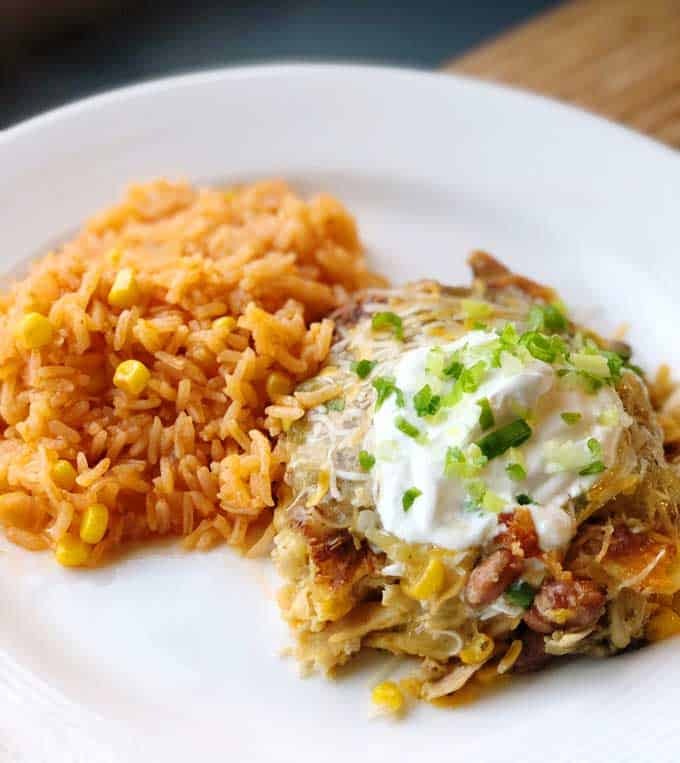 Add a layer of enchilada sauce and repeat layers of cheese, chicken, and corn mixture. Add last 6 tortillas. Add the remaining enchilada sauce and sprinkle the rest of the cheese on top. Bake for 35 minutes then broil an additional 5 minutes to brown the top. Serve with sour cream and green onions or cilantro as desired. Yum! 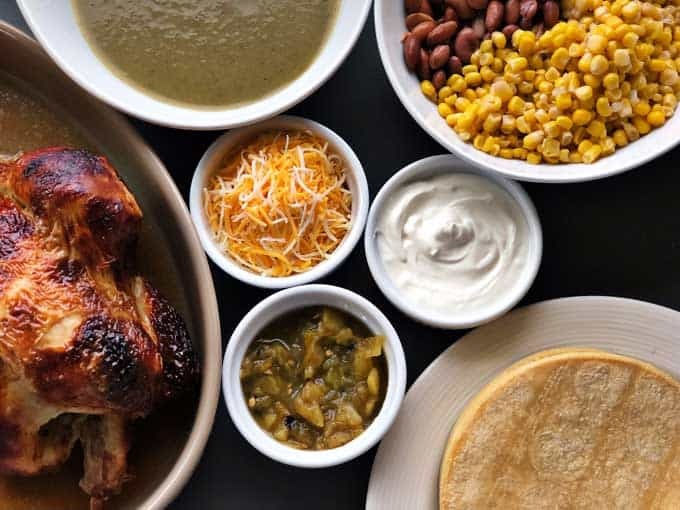 What are your favorite weeknight meals that your family loves? Let me know in the comments, I’m always looking for more ideas!